We recently welcomed a new family to one of our homes in Pencoed who were in need of more accessible facilities to support their needs. Ken, Penny and her two sons were privately renting a first floor flat in the local area for the last six years. However, due to Penny’s limited mobility and health issues, she had become reliant on Ken to help her get in and out of their flat. This unfortunately resulted in Penny falling down the stairs on numerous occasions and made her feel unsettled at the thought of leaving home. They desperately needed to move into a property with a level entrance and accessible washing facilities. It was also important for the family to stay in the Pencoed area for the children’s schools and support network, as one of Penny’s sons lives with Attention Deficit Hyperactivity Disorder (ADHD) which means change can really unsettle him. After waiting a long time to find the right property, Penny and Ken were thrilled to be offered a home with Hafod. 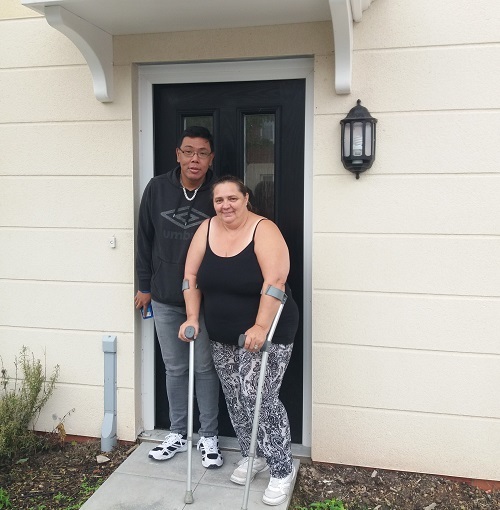 The three bedroom home provides much-needed space for the family and has a walk-in shower room on the ground floor, which Penny has said is going to make the world of difference to her. To find out how you could make a Hafod property your home visit hafod.org.uk or call 0800 024 8968.